So out of boredom I drew a sketch of Rin and Sess and I liked it quite a lot, so I scanned it into my PC, right into Photoshop. I did the basic lineart there, coloured it, painted the sky, the clouds and the birds and added a lot of textures and patterns and light effects and so on and so on. I also drew the patterns of their kimonos. Hope you like, thanks and enjoy! this looks like a stained glass, I like the dusk colors, tho I feel the moon is a bit little, and the could be a bit more shadows on the skin of both. 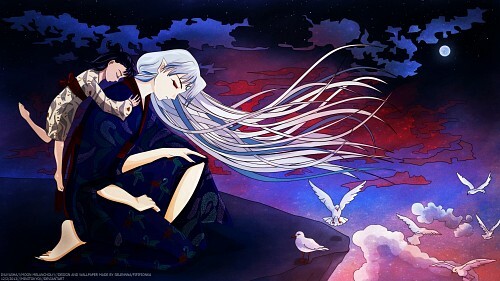 I really love what you did with Sesshoumaru's hair and the sky.